Pinky was the third ferret, he was a stray found by a neighbour and was given to me. He walked into a country-club-house where she was working and was coaxed into a cardboard box with food and captured. When examined he was in poor condition, very thin, his coat very dull, infested with ticks. I dealt with the infestation; using a fine toothed comb, the ticks were combed out on to news paper and the paper subsequently burnt . He soon gained weight and became fat, the fatness was in part due to me giving him too much milk and feeding canned cat food. I have since learnt that milk should be half-diluted with water, which is okay, but regular cows milk will make ferrets fat, and give them diarrhoea because ferrets are said to be lactose intolerant. 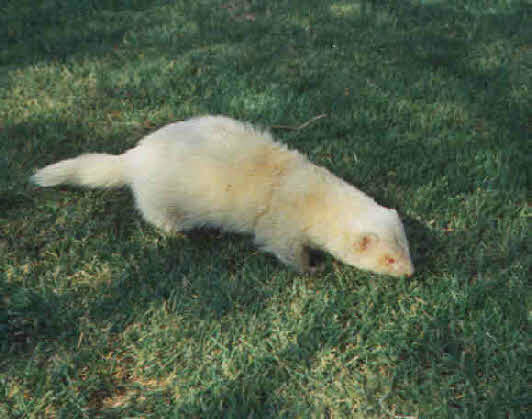 Similar to other ferrets in my early ferret keeping days, he was fed tinned cat food, which in my opinion is fattening and also being soft also causes dental problems, in this instance gingivitis; the veterinarian removed a tooth and de-scaled the other teeth for that reason. I now feed my ferrets with purpose made ferret-kibbles. Pinky would get on well with other ferrets, he was totally gentle with people. He had an unfortunate incident when his tongue bitten while trying to lick ‘Titch’, through the wire mesh of the cage, tearing his tongue.